For hundreds of people over the past 34 years, their first view of Pahrump came on foot. Horace Langford Jr./Pahrump Valley Times An Orange County, California, Sheriff's Department runner reaches the exchange point at state Route 372 and Blagg Road during last year's Baker to Vegas Challenge Cup Relay. Horace Langford Jr./Pahrump Valley Times A Stage 10 runner passes the baton to his Stage 11 teammate with the Orange County, California, Sheriff's Department during the 2017 Baker to Vegas Challenge Cup Relay. Horace Langford Jr./Pahrump Valley Times A Hawthorne, California, runner heads toward the Stage 11 exchange point during the Baker to Vegas Challenge Cup Relay last year along state Route 372. Pahrump is the halfway point of the annual Baker to Vegas Challenge Cup Relay, organized by the Los Angeles Police Revolver and Athletic Club. 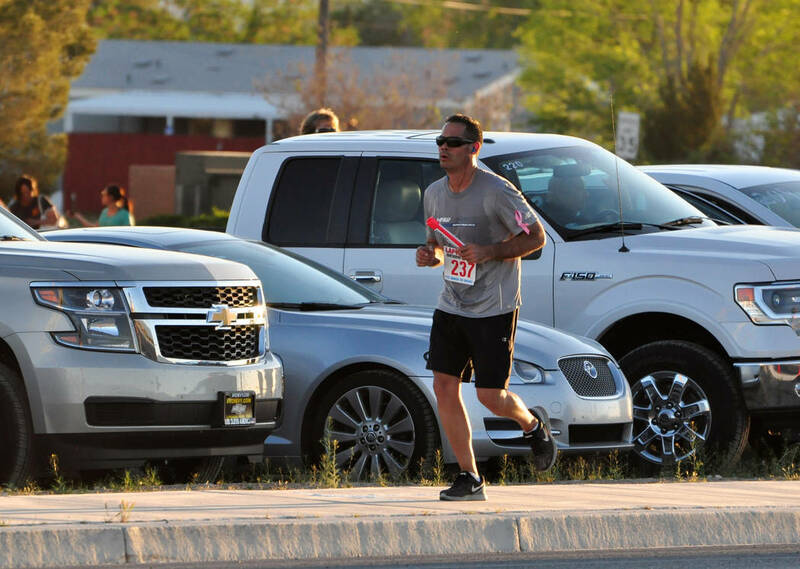 Relay teams made up of law enforcement personnel will pass through town from Saturday evening into early Sunday morning, and the exchange point for Stage 11 of the relay race is at Blagg Road and Nevada Highway 372. At Green Valley Grocery, Assistant Manager Lisa Nielsen and Tisha Dotters have worked race day for the past three years and can’t wait for Saturday. While some working at a convenience store would be terrified of a few hundred people running toward them and another few hundred waiting around to start running away from them and a few hundred support personnel hanging around, Nielsen and Dotters have no worries. The store stocks extra eye drops, hand sanitizer, ChapStick and other essentials, Nielsen said, and both women agree they enjoy doing their part to help the race. “Once you meet all of the people, you’re going to want to work it every year, too,” Dotters said. 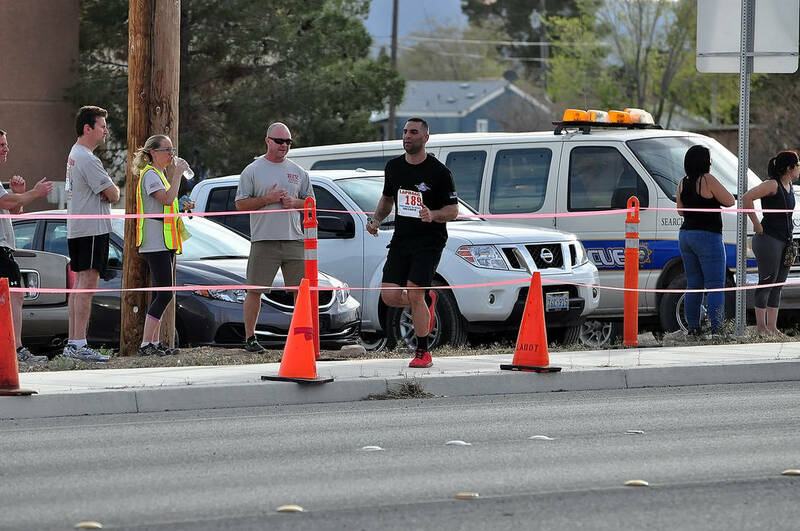 The Green Valley Grocery is not the only familiar sight to veteran Baker to Vegas runners. “The Pahrump Moose Lodge 808 Welcome Wagon is located in front of the Saddle West Hotel,” said Foote. The place for runners and support team members to grab coffee, cookies and bananas that was organized by Alice Eychaner for two decades is a highlight of the race for many. Eychaner merits a place on the race’s website, which lauds her role in making Pahrump a pivotal part of the event’s story. That story began with Foote and the late Larry Moore, Los Angeles police officers who wanted to pick up where the Death Valley Relay ended in 1985. That first year, 19 teams competed in a race that ended on Blue Diamond Road, 13 miles from Las Vegas. This year, a record 276 teams will race 120 miles from just north of Baker to the Westgate Las Vegas. “Each team has 20 runners, anywhere from three to 10 alternates and 20 support people, so about 45 people to a team,” Foote said, meaning roughly 12,500 people will be involved. The Los Angeles Police Federal Credit Union is the title sponsor of the race, which will feature mostly competitors from California but many states will be represented, said Foote. Not represented this year will be the Nye County Sheriff’s Department, which Foote said has fielded a team most years. Of course the sheer magnitude of the event will keep the sheriff’s department busy anyway. With so many participants, organizing the race includes everything from making sure things go smoothly at each of the exchange points to figuring out who starts when. “We start the slowest ones first and the fastest ones last, based on their estimated ability,” Foote said. Los Angeles teams have won the relay for the past 10 years, with a police department team winning each race since 2012 and the Los Angeles Sheriff’s Central Jail team winning four consecutive years before that. An LAPD team has won 16 times overall. The first runners will leave Baker at 8 a.m. Saturday, with the last group getting underway at 4 p.m. 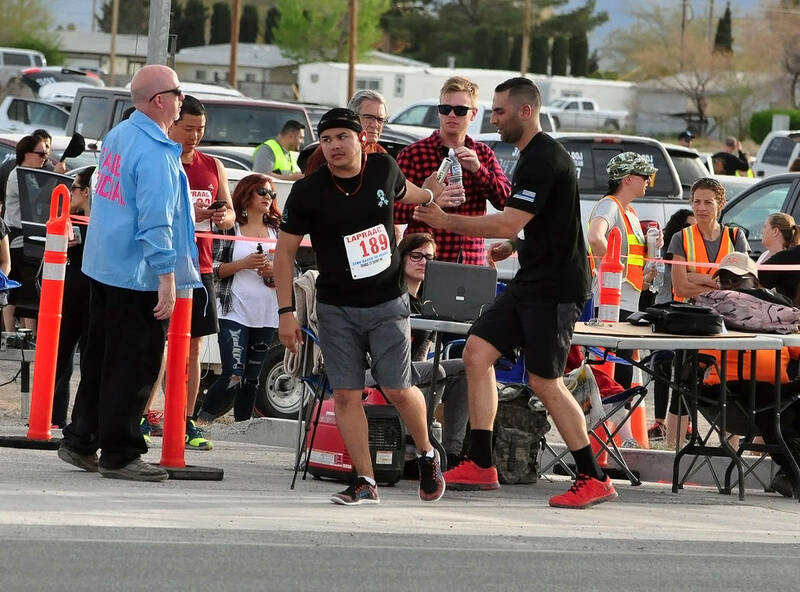 The first runners are expected to arrive at the Stage 11 exchange point at Highway 372 and Blagg Road no earlier than 5 p.m. Saturday, with the last group reaching Pahrump by 11:55 p.m. The Stage 12 exchange point will be at Highway 160 and Dandelion Road, with runners arriving there between 6 p.m. Saturday and 1 a.m. Sunday. Stages are as short as four miles and as long as 10.7 miles, and the difficulty ranges from mostly flat roads around Pahrump to the challenging climb up to Mountain Springs. The course and stages have changed little over the years, according to Foote.